Treadmills are the most popular type of fitness machines for home and at the gym. When deciding to get in shape, many people start with the treadmill and they either purchase one, dig their old one out of storage, or find a gym where they can use one. Treadmills are not intimidating like some fitness machines are, so many people start their fitness journey on one. You can start out walking on a treadmill, and when you’re comfortable, you can begin jogging and then running. If you want resistance without running, you can walk with an elevated incline. Because of their versatility, treadmills are great for beginners and people who are already fit. The ANCHEER App Control Treadmill S8100 is a great treadmill to consider purchasing. It has many bells and whistles to help you along on your fitness journey, the most notable is the fact that it can be controlled with an app so that you can get workouts sent to your treadmill and your treadmill can send you fitness reports. This is an awesome treadmill, and you can find out more about it below. App-controlled with Bluetooth connectivity. Compatible with Android and IOS systems. You can get workouts, personal training reports, and health reports through the app. You can create your own workouts to send to your treadmill from the app. Large LCD screen that displays time, speed, distance, heart rate, and calories. Quiet, even when changing positions. Foldable and on wheels for moving around easily and for easy storage. Max weight is 242 lbs. Is the ANCHEER App Control Treadmill S8100 Worth Buying? This treadmill is a great choice if you’re considering purchasing one for your home. It has many features that can help you reach your fitness goals. The most notable is the fact that it can be controlled by an app and it can also send you fitness reports through the app. If you’d like, you can also create workouts and then send them directly to your phone. The app can help you keep variety in your treadmill workouts, track your progress, and help you monitor your fitness. The ANCHEER app control treadmill S8100 is well made, and designed with the user in mind. The app is only one feature to consider. 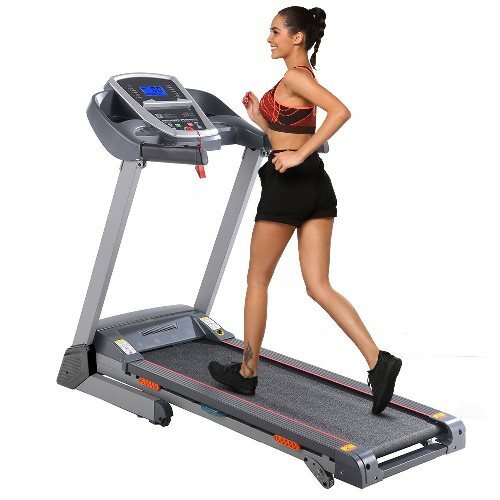 This treadmill also has an LCD display screen that displays time, speed, distance, heart rate, and calories so that you can monitor your progress during workouts. It also has a tablet or phone stand so that you can listen to music or read while walking. If you want, you can play your MP3 player through the speakers on the treadmill. The ANCHEER app controlled treadmill S8100 can be folded up when not in use. It also has wheels on it so that it can be moved easily. This is a great feature because you can free up some floor space when you’re not using the treadmill. This treadmill is only rated for 242 lbs, so this treadmill won’t be right for everyone. If you’re over 242 lbs, pass on this one and find one that is appropriate so that you don’t get injured. Treadmills are an excellent fitness machine to purchase for your home. You can walk, jog, or run on a treadmill all in the comfort of your own home. The app control for this treadmill can help you keep variety in your workouts, and it will help you monitor your progress. This is a great option if you’re looking for a treadmill. Previous Previous post: What’s the Perfect Nap Length?